Attendees at the Law Libraries Section Standing Committee Meeting at IFLA WLIC 2018. Several members of the FCIL SIS joined 3500+ librarian colleagues in Kuala Lumpur, Malaysia, this past August 24-30 for the World Library and Information Congress (WLIC), the annual conference of the International Federation of Library Associations and Institutions (IFLA). IFLA’s Law Libraries Section sponsored two educational programs during the WLIC. In this post, we provide detailed accounts of these two programs, which focused on the importance that access to, and an understanding of the law, plays in times of crisis as well as in everyday life. For a report from the overall WLIC conference, including details of the Law Libraries Section’s business meetings, please see the October issue of the FCIL SIS newsletter. FCIS SIS member Heather Casey chaired a program featuring speakers from three different libraries providing examples of different roles played by government and law libraries in responding to crises, access to justice initiatives, and social advocacy projects. Edita Bačić, Dr. Yolanda Jones, and Jane Sanchez present on “The Role of Government and Law Libraries in Times of Crisis and Turmoil” at IFLA WLIC 2018. Jane Sanchez, Law Librarian of Congress presented on the actions that the Law Library of Congress has taken to promote peace, democracy, and the rule of law in countries in turmoil, either from war or natural disaster. In addition to donating books and helping to reconstruct a legal research collection, the LLoC has facilitated virtual repatriation of legal materials by digitizing countries’ law holdings at Library of Congress. Recent efforts have involved legal materials in war-torn Afghanistan, in Haiti after the 2010 earthquake, and with the State Attorney’s Office of Puerto Rico after hurricanes Irma and Maria. AALL member, Dr. Yolanda Jones, Director, Florida A&M (FAMU) College of Law Library, discussed her paper titled “The Special Access to Justice Mission of an HBCU” and illustrated the response of an academic law library at a Historically Black College or University in the United States to provide access to law and justice services to under-served communities. In addition to serving the FAMU Law School community, Dr. Jones’ library serves as the county library, and 50% of their reference desk traffic comes from members of the public and local attorneys. Edita Bačić, Faculty of Law, at the University of Split in Croatia, reflected on the role of librarians as social and political forces in a presentation titled “Neutrality Versus Proactivity in Libraries during Turbulent Times.” She shared her experiences as a librarian advocating for improvement of social conditions in Croatia. Ms. Bačić asserted that human rights, the right to information, and the need for social inclusion are the bases of modern social movements in achieving social justice, and that librarians need to be an active force proactively involved in the life of their community. She maintained that librarianship is no longer limited to professional responsibility in relation to the library users and that there is a responsibility for development of the entire community. Dave Nolette and Sonia Poulin of Vancouver’s Justice Education Society present at IFLA WLIC 2018. Chaired and moderated by Law Libraries Section Standing Committee Chair Sonia Poulin of the Justice Education Society, Vancouver, British Columbia, this program discussed two initiatives, one in Canada and one in the United States, that seek to enable youth and adults to acquire “legal capability,” described as the knowledge, understanding and life skills necessary to engage with the law in everyday issues carrying legal implications. Speakers Dave Nolette and Marc Legacy from the Justice Education Society provided an overview of the types of skills and behaviors their organization helps build in the K-12 curriculum and via web services. The goal is for their clients to learn about the law, to recognize and diagnose legal problems, and to gain the competencies necessary to identify risks, address and resolve conflicts, communicate, negotiate, and think critically about issues. Speaker Bonnie Rose Hough, Principal Managing Attorney for the Center for Families, Children & the Courts of the Judicial Council of California, oversees the California court system’s Access to Justice, Self Help, Family Law, Domestic Violence, and Tribal/State programs. Via video, Ms. Hough shared statistics about the large percentage of litigants in the California courts who do not have legal representation, and she described the California courts’ self-help system, which provides thousands of legal documents and forms, many translated into Spanish (and some in Chinese, Korean and Vietnamese), to assist unrepresented litigants. At next year’s WLIC in Athens, Greece, the Law Libraries Section will again sponsor two programs. We hope to see you there! The International Federation of Library Associations (IFLA) held its 83rd World Library and Information Congress (WLIC) in Wrocław, Poland, from August 19-25, 2017. What follows are my reflections on the conference as a first-time attendee. I’ll have more to say about Wrocław as a travel destination in a future blog post. Three things set the IFLA WLIC apart from other library conferences. The first is its size. It’s not in the same league as the American Library Association’s annual meeting, but it is much larger than any other library conference that I’ve attended. As with other conferences, attendance varies from year to year, depending on the venue. This year there were 3,300 librarians at the conference – roughly 50 percent more than the number who attended the annual meeting of the American Association of Law Libraries in Austin. The second notable feature of the IFLA conference is its geographic, ethnic, and linguistic diversity. This was not my first international library conference. I attended the annual meeting of the International Association of Law Libraries (IALL) in Buenos Aires in 2014 and in Oxford in 2016. Although I thoroughly enjoyed the IALL conferences, librarians from English-speaking jurisdictions in the developed world accounted for a disproportionate share of the attendees, with most of the rest coming from Western Europe and only a smattering of librarians from elsewhere in the world. The IFLA conference, by contrast, included librarians from 122 countries on every continent. Developed countries were over-represented, but less so than at the IALL conferences I’ve attended. Only ten percent of the librarians were from the United States. This was my first conference where the majority of the attendees were not native English speakers. That made it feel like a truly international gathering. The third thing that sets the IFLA conference apart is its length — seven full days. The conference got underway on Saturday, August 19, with a series of business meetings for IFLA’s sections (including the Law Libraries Section) and interest groups. Caucuses for regional, national, and language groups also held meetings on Saturday. Substantive programming began on Sunday, August 20, and continued through Thursday, August 24. The final day of the conference was devoted to library tours, both within Wrocław and in other cities and towns throughout southwest and south central Poland. I attended the Newcomer’s Session, which took place early on Sunday morning, immediately prior to the Opening Session. It included an introduction to IFLA by its outgoing president, Donna Scheeder; remarks from the president-elect, Gloria Pérez Salmerón; an overview of the conference and how to get the most out of it; as well as an opportunity to get acquainted with other newbies. The Opening Session featured a keynote address by British historian Richard Butterwick-Pawlikowski entitled Where Were You Going, Poland, When You Were So Rudely Interrupted? In addition to introducing the audience to some of the recurring themes and continuities in Poland’s tumultuous history, the address also offered insights into the country’s transition to democracy since the fall of the communist regime in 1989. I knew from speaking with one of my Georgetown colleagues, who attended last year’s IFLA conference in Columbus, that the Opening Session would conclude with an entertainment segment showcasing the host city. Even so, I was not entirely prepared for the ensuing 30-minute Broadway-style extravaganza, which employed a combination of interpretive dance and acrobatics to illustrate Wrocław’s thousand-year history. Of all the library conferences I’ve attended, this one’s opening session definitely had the best production values! Once the substantive programming got underway, I focused my attention on sessions that were sponsored in whole or in part by IFLA’s Law Libraries Section. These included a session addressing the Challenges for Legal Research and Methodology in Post-Communist Eastern Europe, as well as a session on Optimizing Subject Access to Legal Materials. The latter featured an informative presentation on EuroVoc, a multilingual controlled vocabulary developed by the Publications Office of the European Union (paper available for download here). At a session sponsored by the Government Information Section, I learned about Global Online Access to Legal Information (GOALI), a new initiative that is working with commercial publishers to provide free or low cost access to legal materials in developing countries. GOALI is spearheaded by the International Labour Organization in partnership with Yale Law Library and Cornell Law Library. Access will be provided on an institutional basis to law schools, courts, government agencies, law libraries, and local NGOs operating in selected jurisdictions. GOALI’s online platform is expected to launch in February of 2018. I particularly enjoyed a session on Transparency, Openness, and Engagement sponsored by the Parliamentary Libraries Section. It included a presentation on a data visualization tool for public finances developed by librarians at the Chilean National Congress. Another presentation described REDIPAL, an open platform for exchanging information about legislation pending in the Chamber of Deputies, the lower house of Mexico’s national legislature. These presentations were followed by break-out sessions during which each presenter met with members of the audience for a more in-depth discussion. I also attended the business meeting of IFLA’s Law Libraries Section, which provided me with a better understanding of what it does and how it operates. One of the highlights of the business meeting was a report on two very successful workshops on open access to legal information that were co-sponsored by IFLA. The workshops took place in Kampala, Uganda, in December of 2016, and in Abidjan, Côte d’Ivoire, in May of 2017. Plans for a third workshop to be held elsewhere in sub-Saharan Africa in 2018 already are underway. Another highlight of the business meeting was a report on the adoption of a Statement on Government Provision of Public Legal Information in the Digital Age by the IFLA Governing Board in December of 2016. The statement, which includes provisions on authentication and digital preservation for long-term access, was drafted by members of the Standing Committee of the Law Libraries Section. Its formal adoption by IFLA’s Governing Board marked the culmination of a long-term project that helped to raise the profile of the Law Libraries Section. To broaden my horizons, I attended several sessions that had nothing to with legal information. Among the most memorable was a session on Libraries in Times of Crisis, which featured a heartbreaking presentation that documented the deliberate targeting and destruction of libraries and archives during the civil war in Somalia. Another session on Information Inequality stood out for a presentation on linguistic minorities, who often struggle to access information online, where English and a handful of other widely spoken languages predominate. For a librarian who often assists faculty and students trying to find reliable English translations of foreign laws, this presentation brought a welcome change of perspective. One of the most important benefits of attending the IFLA conference was the opportunity to network with other librarians, particularly those from other countries and institutions outside the U.S. I was especially pleased to meet librarians from the House of Commons Library and the European Parliament Library, since many of the faculty and students that I work with are interested in writing about Britain’s impending withdrawal from the European Union. It would have been difficult to navigate a conference as large as IFLA without advice from veterans. Sally Holterhoff and Teresa Miguel-Sterns were especially helpful to me in this respect. I also would like to extend my thanks to Sonia Poulin, the chair of the Standing Committee of IFLA’s Law Libraries Section, for her welcoming spirit and for making sure that I had someone to join me for dinner each evening. I encourage any librarian who works with foreign and international legal materials to consider attending the IFLA conference, particularly if it is being held in a jurisdiction that is of interest to you or to a faculty member with whom you work. Next year’s conference will take place in Kuala Lumpur. The role of the libraries in providing access to legal information in Africa was the focus of the first session of the Law Libraries Standing Committee (SC) on Tuesday: Access to Legal Information and Legislative Data in Africa: the Role of Libraries and Librarians. This session was organized in collaboration with two other sections: Library and Research Services for Parliaments and the Regional Office for Africa. The session was chaired by Margo Jeske, from the Faculty of Law, University of Ottawa and Victoria Okojie from Nigeria. Yolanda Jones, from Florida A&M University, College of Law and Caroline Ilako, from Makarere University in Uganda, approached the topic from a comparative perspective Dynamic Law Libraries: Access, Development and Transformation in Africa and the United States. Speakers highlighted for some of the countries the enactment of laws or the creation of institutions to encourage building local capacity to collect, publish and keep legal information up-to-date. Across the countries the speakers enunciated similar challenges to sustain technical and physical capacity to publish the law; barriers are not only financial and technical but also institutional, changes in government organizations, for example. Kenya Law was presented as a model to be followed. Speakers discussed the role that libraries can play as collectors and providers of legal information and services, especially public libraries; several examples were given in the United States. One hundred and fifty librarians attended this first session. On Tuesday evening the Law Libraries SC held its second business meeting chaired by Sonia Poulin (filling in for Claire Germain who was unable to attend). During this second business meeting the SC reviewed the events of the week and heard the reports of the members that attended relevant business or professional meetings. Sally Holterhoff and Marisol Floren reported on a meeting they had Sunday with Patrice Landry and Frederick Zarndt from IFLA’s Committee on Standards regarding the possibility of developing a standard on authentication of online legal materials. Sonia Poulin, Elizabeth Naumczyk and Marisol Floren, as new incoming officers, attended two leadership forums and a training session on IFLA about its operation and strategic plans, which provided guidelines for the operation of the sections. The topics of next year’s programs in Ohio were defined and program coordinators and teams were assigned. Two main areas of interest for next year’s programs were (a) digital privacy including the issues raised by “the right to be forgotten;” and (b) outreach by law librarians to public libraries to increase access to legal materials, improving access to justice for the public. The section has agreed to be involved with a 2016 IFLA pre-conference in Toronto on managing human resources in the library context. Today is the last Law Library SC session, on the Future of Law Libraries. This session will be chaired by Sonia Poulin, from Alberta Law Libraries and Information Services, Canada. Speakers are Kirsty MacPhee from Tottle Partners, Australia; Carole Aippersbach (Alberta Legal Information Society, Canada); Allen Guerra Bustamante (Library of Congress Chile); Ali Irhamni and Joko Santoso (National Library of Indonesia), Yani Nurhadyani (Bogor Agricultural University, Indonesia); and Denisse Espinace y Carolina Salas (Library of Congress Chile). This is our last report…later today we both begin our long journeys back to the U.S., tired but very inspired and full of new ideas and information from our 2015 IFLA experience. All papers from IFLA sessions are posted in IFLA Law Library and please watch for a full report from us in the fall issue of the FCIL Newsletter. The IFLA conference opening session was a big, bright, colourful and inspiring welcome to Africa. We were treated to a variety of entertainment, including storytelling, songs by the Children’s Choir and songs by leading South African singer, Vicki Sampson. This whetted our appetite for Tuesday evening’s cultural evening. Many papers from the programs at the IFLA conference are freely available and can be found at the IFLA web site’s repository at http://library.ifla.org/. You can get a taste of the variety of program offerings by perusing the repository. A highlight of the conference for law librarians was the annual reception. This year’s event was hosted by the organisation of South African Law Libraries (OSALL) and was held at the new Cape Town law office of Bowman Gilfillan on Monday evening. We were joined by law librarians from the other offices of Bowman Gilfillan and other local law librarians and enjoyed good wine and food provided by South African legal publisher, Juta as we toured the new library and enjoyed the spectacular harbour views from the library’s balcony. It was an evening of laughter and friendship and the IFLA guests took advantage of the opportunity to have informal conversations about South African legal research sources and local sightseeing recommendations. A heartfelt thank you to Charmaine Bertram and our South African law librarian colleagues for being such gracious hosts. A section of the exhibit hall was devoted to a display of over one hundred and thirty posters. From noon – 2 pm on two days of the conference, the poster authors were available to discuss their posters. An impressive poster was the one describing The African Law Library (ALL) a web site offering a variety of documents from different African jurisdictions. The ALL is a member of the Free Access to Law Movement (FALM). John Miller, Senior Librarian and Shella Hurree – Online Librarian spoke enthusiastically about their work in progress in increasing the amount of free legal information from all African jurisdictions. Review the ALL to see if this merits inclusion in your research guides. Sally Holterhoff’s poster succinctly set out Valparaiso Law Library’s revamped legal research program for JD students. Sally entertained a variety of questions about the program and their process of continuous improvement to teach legal research problem solving concepts – the process of finding and appropriately applying legal information to address legal issues. As is the tradition in IFLA the day before the opening of the official program on Sunday, the different officers and members of Sections and Special Interest Groups convene to discuss issues related to their programs and activities. The Law Libraries Standing Committee held on Saturday the first of the two business meetings that will take place during the conference. We are looking forward to two programs organized by the Standing Committee on the topics of: (a) Access to Legal Information and Legislative Data in Africa: The Role of Libraries and Librarians; and (b) the Future of Law Libraries: Tales of Existence and Transformation. The first session will take place on Tuesday, August 18, and the second session on Thursday August 20. 2015 marks the 10th anniversary of the Law Libraries Standing Committee. Sinikka Sipila, IFLA President, and Donna Scheeder, President Elect, attended the meeting. They discussed the work that is being developed by the Law Libraries Section on access and authentication of legal information and outlined the meeting that will discuss IFLA’s strategic plan that will model the UN SDGs. One of the highlights of this year IFLA conference is the impact of the Lyon Declaration on Access to Information and Development and the recently approved United Nations Sustainable Development Goals (SDGs). The SDGs articulate that: “…access to information, knowledge and technologies are critical for the eradication of the major development challenges…the strengthening of democracy; and the promotion of social justice and cohesion …” This great accomplishment demonstrates IFLA’s advocacy to influence the United Nations (UN) for the inclusion of libraries within their post 2015 development agenda. Because Claire Germain, Chair of the Standing Committee, was not able to attend the Conference, the meeting was chaired by Pascal Sanz (National Library of France) and Sonia Poulin (Alberta Law Libraries, Canada). During the business meeting the Standing Committee elected new incoming officers and recognized the worked done by the outgoing members of the Standing Committee. New officers of the Standing Committee: Chair (Sonia Poulin), Secretary (Elizabeth Naumczyk, International Criminal Court) and Information Coordinator (Marisol Floren, United States). Some possible topics for next year program were discussed as well; this discussion will continue during the following days and the second business meeting to be held on Tuesday. Another important event of the day was the meeting of the USA Caucus. Members of the US delegation are working in different IFLA’s Committees especially on Freedom of Access to Information and Freedom of Expression (FAIFE), and Copyright and Other Legal Matters (CLM). They are developing a joint program on Tuesday on The Ethics of Access: Exploring Copyright, Licensing and Privacy in the Digital Environment. The organizing committee for IFLA 2016 to be held in Ohio reported on the events that will take place next year. One of the new features for next year is the Scholarship Program which will sponsor librarians from the United States and worldwide to attend IFLA in Ohio in 2016. ALA will be coordinating this program, targeted to the new generation of librarians. The application form will be online and the call out is programed for the end of September. Several AALL and FCIL-SIS members were among the nearly 4000 attendees at the 80th IFLA World Library Information Congress, held in Lyon, France, August 16-22, 2014, with a theme of “Libraries, Citizens, Societies: Confluence for Knowledge.” This was my first time attending IFLA, and I had the honor of doing so as Representative from AALL to IFLA. 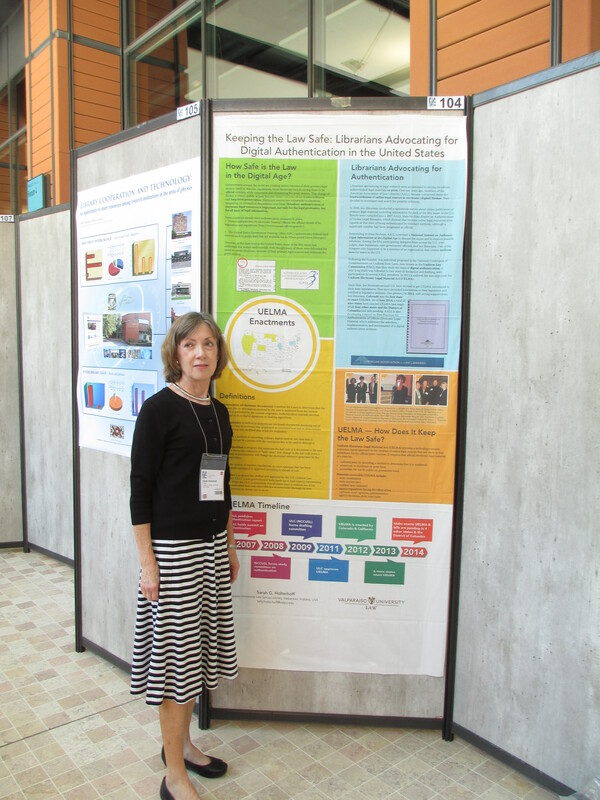 Sally Holterhoff and her poster on authentication and advocacy by law librarians in the United States. The biggest conference-wide news was the highly-anticipated launch of the Lyon Declaration on Access to Information and Development, which outlines the need for access to information to be recognized in the United Nations post-2015 development framework and calls upon member states of the United Nations to acknowledge that access to information, and the skills to use it effectively, are required for sustainable development. IFLA is encouraging organizations and institutions to sign onto the Declaration, which is currently under review by AALL’s leadership. 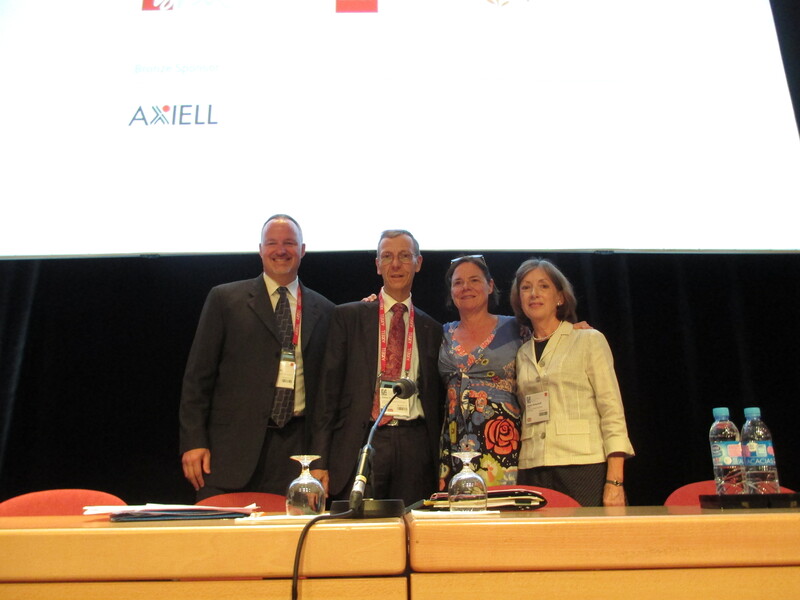 Claire Germain presided as Chair over the two meetings of the Standing Committee for the IFLA Law Libraries Section. The Standing Committee and observers discussed issues relevant for the diverse group of law libraries represented and planned the Section’s activities for the coming year. A Working Group comprised of Sally Holterhoff and Marisol Floren provided the Section with an update on their Report on Access to Digital Legal Information, which assesses the official status, open access and authentication of legal gazettes. The report now covers all of Latin America and the Caribbean and work continues to assess gazettes worldwide. 2) Access to Law at the Digital Cross Roads: Innovative Solutions to Complex Challenges, with multiple speakers presenting on topics ranging from building a digital repository for Myanmar’s Parliament to collaborative digitization of French heritage legal collections to designing a service-oriented architecture for automatic mark-up of documents in the Chilean Congress. Materials for these programs are accessible in the WLIC program. the poster were interested not only in the specific issue of authentication but also in the role American law librarians play in advocacy efforts and the support they receive from AALL. The Law Libraries Section enjoyed a presentation and reception at the Bibliothèque Municpale de Lyon, where we learned about the fascinating (and somewhat grisly) special collection of materials belonging to early 20th century French criminologist, physician and forensics expert, Alexandre Lacassagne. Many law librarians and parliamentary librarians from diverse jurisdictions expressed interest in the FCIL Schaffer Grant and in the FCIL-SIS Clearinghouse for Internships and International Personnel Exchanges. These colleagues were pleased to have the information and flyers provided by the FCIL-SIS for these programs. 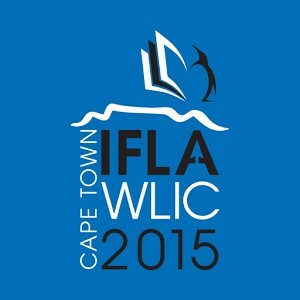 The IFLA World Library Information Congress will meet in Cape Town, South Africa in August, 2015, and the Law Libraries Section will once again be an active presence. Keep 2016 in mind as well: the Congress will meet much closer to home in Columbus, Ohio. From the program on authentication of legal gazettes worldwide, left to right: Charley Barth, Office of the Federal Register; Didier François, French Directorate of Legal and Administrative Information; Martine Reicherts, European Union Commissioner for Justice, Citizenship and Fundamental Rights; and Sally Holterhoff, Valparaiso University Law School and former President of the American Association of Law Libraries.